The other day, I posted about the Ricoh Theta V. There is increasing evidence that the Theta V is the Theta 4K after all. Here are 5 other details about the new Theta V.
Back at NAB Show 2017, Ricoh showed the Theta 4K. 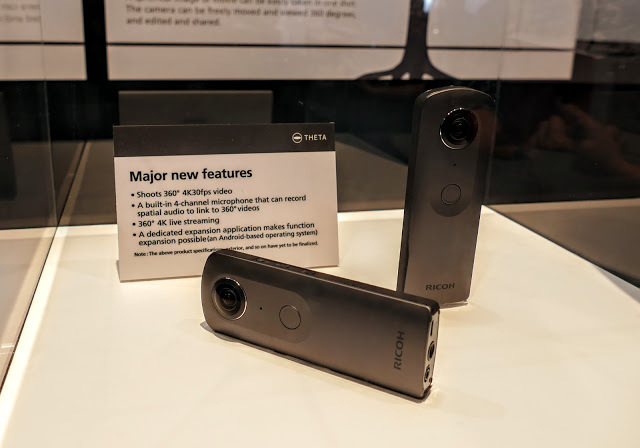 They showed the base of the Theta 4K which has a microphone input jack, just like the Theta V.
As I mentinoed the other day, a microphone input is useful for video, which is not often used in the Ricoh Theta S or SC because of the relatively low resolution (1920 x 960). It is more likely that they are one and the same. Here are 5 other details about the Theta V.
1. 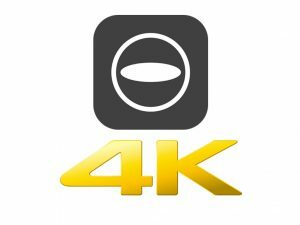 Why the Theta 4K is being named the Theta V.
Why doesn’t Ricoh just call the new Theta the Theta 4K? One reason could be the Japanese aversion for the number 4, which is a homonym for ‘death’ in Japanese and Chinese (this is why you won’t see a fourth floor on most buildings in Japan and many other East Asian countries). Conceivably, this tetraphobia could even be the reason Ricoh avoided designating this important model as their fourth Theta. The Theta V name reflects the fact that it is the fifth one after the original, m15, S, and SC, and perhaps as one reader suggested, it could also refer to Video. To date, all models of the Ricoh Theta have had built-in storage instead of a removable memory card. The Theta actually uses a Micro SD but it is enclosed in the Theta’s case. Some users have wanted removable storage to increase the capacity of the Theta. However, based on the interior photos of the Theta V posted with its FCC filing, it appears that the Theta V will not have removable storage. The photos from the FCC filing show that there is no door for the battery, which means that the battery will once again be fully enclosed. In previous Theta cameras, this wasn’t a big deal because of the Theta’s decent battery life. However, 4K video will use up the battery more quickly. We’ll have to see if this affects the Theta V’s battery life in the real world. 4. It appears the Theta V will use a Qualcomm Snapdragon processor. The interior photos of the Theta V show that the processor is by Qualcomm. Using a Snapdragon processor makes sense because one of the Theta V’s features is compatibility with Android OS. 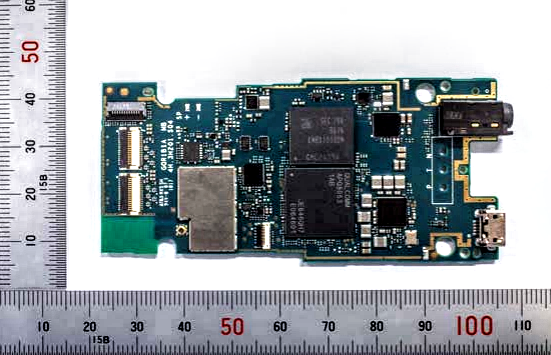 The other day, I speculated whether the new SC2000 processor by Fujitsu / Panasonic’s Socionext could be the new processor for the Theta V. Given that the photos show a Qualcomm processor, it seems to suggest that the Theta V won’t in fact be using an Sc2000 processor, which all but rules out the advanced features shown in the SC2000 demo videos. Thank you very much to Daniel Smith for the super sleuthing! To stay updated about the Ricoh Theta V and other 360 cameras, please subscribe and/or Like the 360 Rumors Facebook page. Thank you very much!